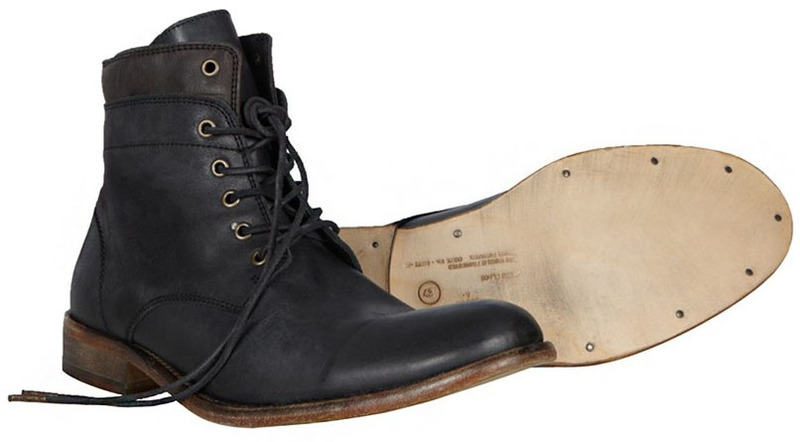 Shock of shocks – All Saints, the makers of the Layer boots as worn by Matt Smith in series five, have brought the style of boots back in stock! 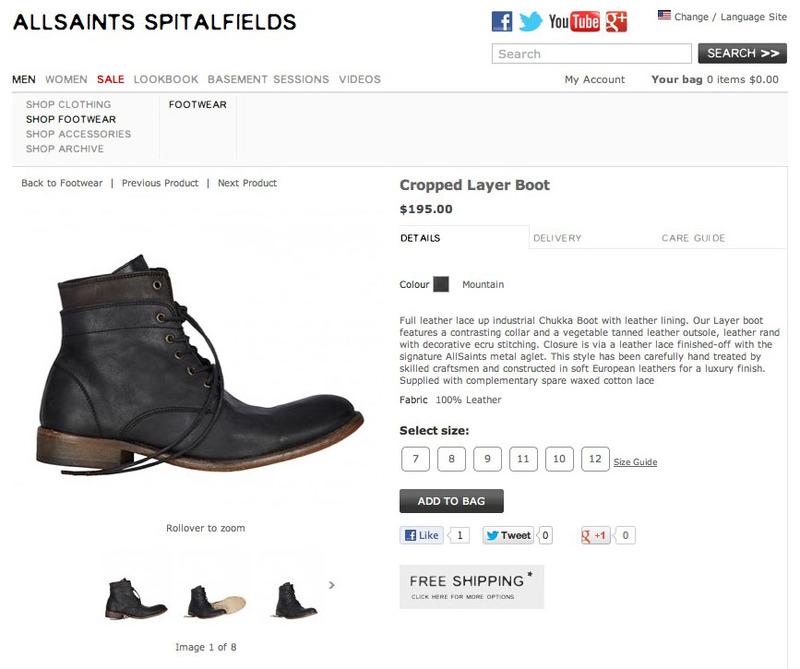 The new boots are currently ONLY available through the US site. Don’t get too excited though. Firstly don’t forget Matt wore replicas of the boots; and these ones are called Cropped Layer Boots as they are one eyelet shorter at the top. 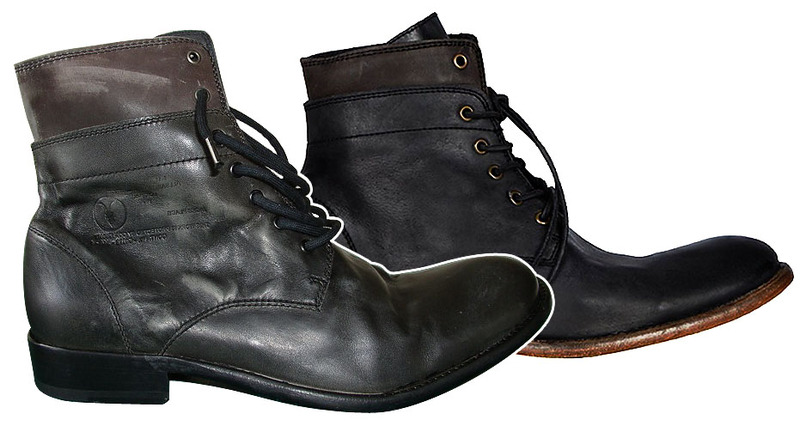 Here is a comparison between my own Layer Boots, and the new Cropped Layer Boots. If you want to be picky, the soles are now a tan leather rather than black, but if you can overlook these couple of slight differences, they are probably worth getting. A few days ago I went to the re-opening of the Doctor Who Experience at its new home in Cardiff. 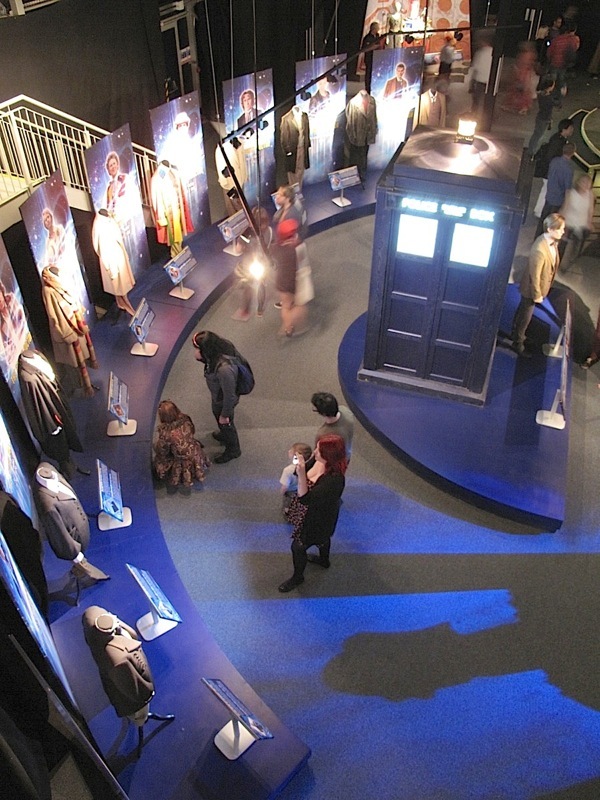 There are two parts to the Experience: an interactive walk-through show; followed by an extensive exhibition space displaying all manner of costumes and props from almost the entire run of the series from 1963. 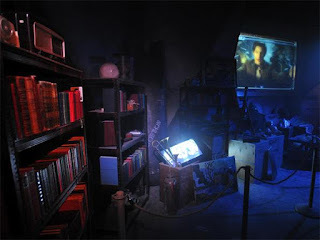 The interactive show, bar the addition of updating a clip compilation right at the start, everything is exactly the same, down to the layout of the rooms and corridors you walk through. Photography isn’t permitted in this part of visit, so there’s not much to show. I don’t want to spoil it for anyone who hasn’t been, but I will say when you enter the first room take advantage before the lights are dimmed to look around the room and see all the various artefacts representing nearly five decades of Doctor Who. The exhibition part of the Experience is now expanded and covers two floors - more than can be covered in one posting. Here is the first half of my review. As per the Olympia version of the experience, once you’re out of the interactive parts you then move into the exhibition stage of the event. With little exception (which I’ll come on to later) most of the exhibits are exactly the same as before, but now it is in a two floor purpose-built venue, they are laid out much better. 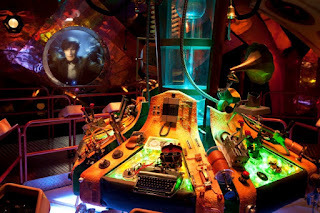 For example, if you find the right vantage point it is now possible to see all three Police Boxes at once, where they were previous in separate areas. The exhibition comprises of both classic and new series displays, often sitting along side each other, with equal prominence. The new series displays do have an obvious Eleventh Doctor bias. After a six month absence, the Doctor Who Experience reopens today at its new purpose-built venue in Cardiff bay, barely a stones throw from the new BBC studios where the series is now shot. I booked my ticket last month as soon as they were available, plus a return train trip so I was all prepared well in advance. It meant an early start, but it would be worth the effort - or so I thought. Trains to Cardiff depart from Paddington station in London, and I got there in plenty of time to discover someone had been hit by a train on the line and all departures were cancelled for the foreseeable future. Great. The station was packed with disgruntled passengers looking disbelievingly at the departure boards of doom. My planned train was listed as delayed, but this was soon revised to cancelled, dashing my hopes of departing on time. Signed up to the air of despair, I sat waiting and listening to the endless repeating announcements and I started to wonder if I was gonna get there in time. The next train I could get was flashing delayed too, but then suddenly switched to boarding, prompting a mass stampede towards platform 9! Swept along in the rush, I managed to sprint to the front of the trains and a near empty carriage, bagging a table seat in the process. The train quickly filled, with standing room only, and after a bit of a delay we set off - only 45 minutes later than planned. So after a shaky start and wondering if I was going to miss the whole thing, I finally arrive in Cardiff, with time to spare. 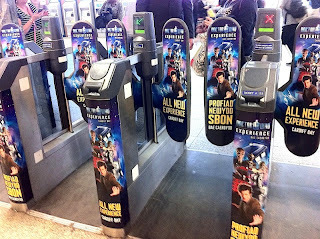 The ticket barriers at Cardiff Central station were decked out with Doctor Who Experience branding, which was cool. Having visited the area twice before, I know the walk from the station to the bay quite well, and it was a nice day so I took my time. As it happened I passed a billboard poster for the Experience, which I might have missed otherwise. 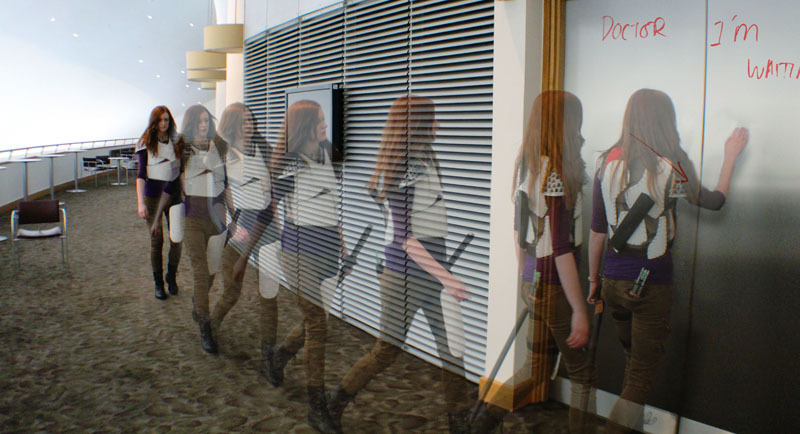 It wasn’t long before I was passing the Millennium Centre, for me still full of happy memories from the Official Convention and our Girl Who STILL Waited photoshoot. Coming around the bay there was a bit of a buzz, with people in front of me heading in the same direction, many wearing Who-related t-shirts. 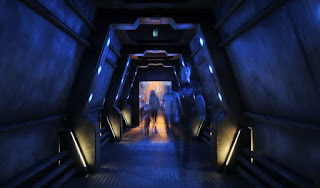 I had visited the site of the new home to The Experience in March, so I knew where I was heading, and by the queue so did everyone else! There were a LOT of people queued up waiting for the noon opening. 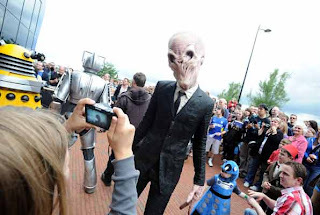 To entertain the crowd, a Dalek, Cyberman, Silence and Silurian were on patrol for photo-ops, with some concerned looking kids keeping their distance with their parents for protection. As the queue slowly moved closer to the entrance, I was approached by a couple of Who fans I had seen at Chicago TARDIS last November! They had come over specially for the opening. 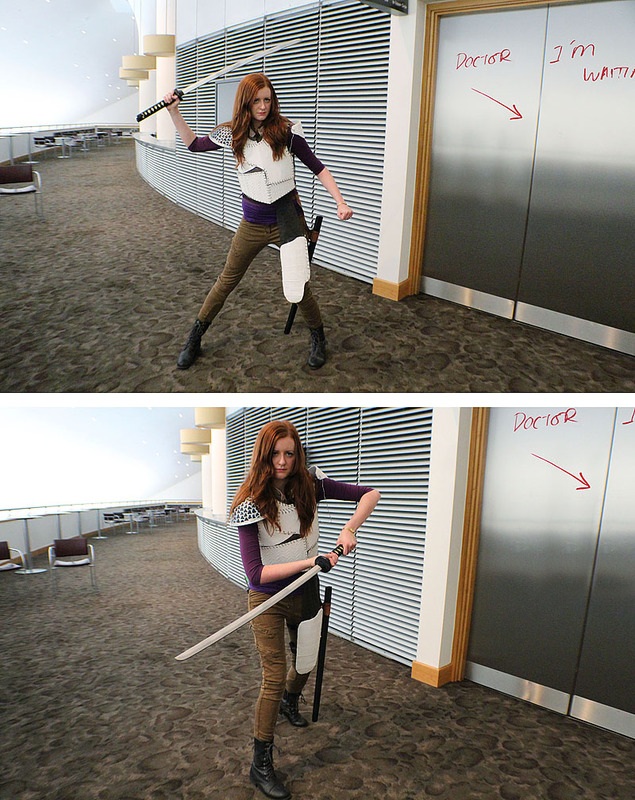 That’s dedication for you. In the lobby I was surprised to see Bessie, Jon Pertwee’s trusty car. It was cool to see, but I did wonder if any of the kids coming today even knew what it was. Around the walls of the lobby are a series of graphics depicting monsters from the new series, and strangely an image of an Ice Warrior dating back to the Patrick Troughton era. I wonder if that’s a clue of what’s to come in series seven? 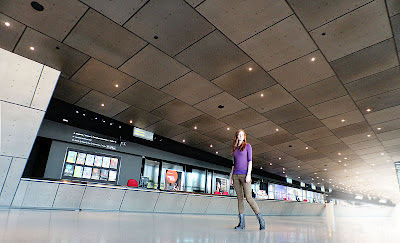 Ticket checked, I was finally inside the building and in the queue to see the Experience part of my visit. My ticket is for a one hour entry slot, which is a bit flexible, and you enter in groups of around 20 to 25 people. As you move through the stages of the interactive show, the next group is entering behind you unseen, so I guess around three or four groups are at various stages at any one time. Check back soon and I’ll tell you what to expect to see beyond those entry doors . . . Thank heavens June is over! It’s been the busiest month since I left full time employment, and my most productive by far. 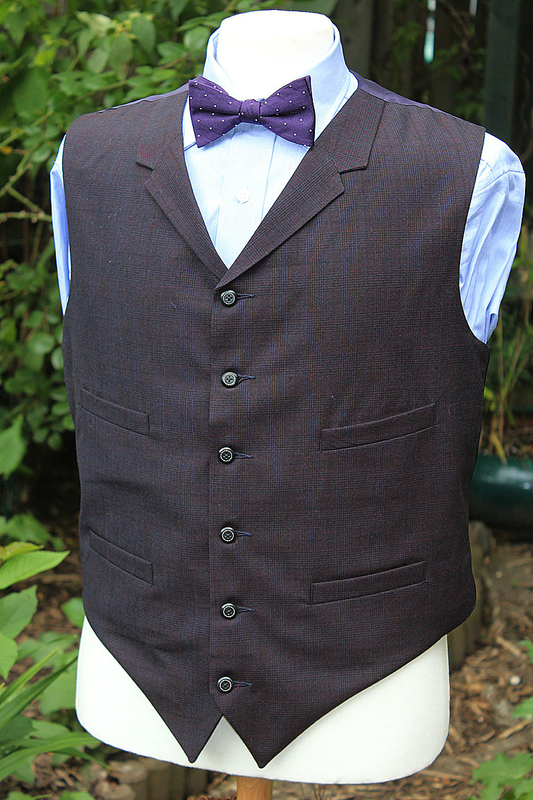 I work very hard as a tailor and set myself a target of dispatching one garment a week, wether that be a Utah Shirt or a more complex Tennant Coat or or Greatcoat. Well this month I hit nine items, over half of which were in the upper end category - a personal best to date! But as well as chaining myself to the trusty treadle-mounted Singer, I’ve also been out and about doing the BritTours guided tours of London Doctor Who locations - and that’s been the busiest ever too! I’ve done almost a dozen tours this year - peaking this month at a little over one a week. Although the route and content is the same, each tour turns out slightly different to the previous depending on the memeber of the tour party and the conversation we have between stops. A little while back I did a tour where we arrived at John Adam Street, only to discover it was dressed as Downing Street, just the same way it had been for Aliens Of London back in 2005. That was the highlight of the tour that day. As a group it was funny how excited they all got over seeing the man-hole cover seen in The Invasion! 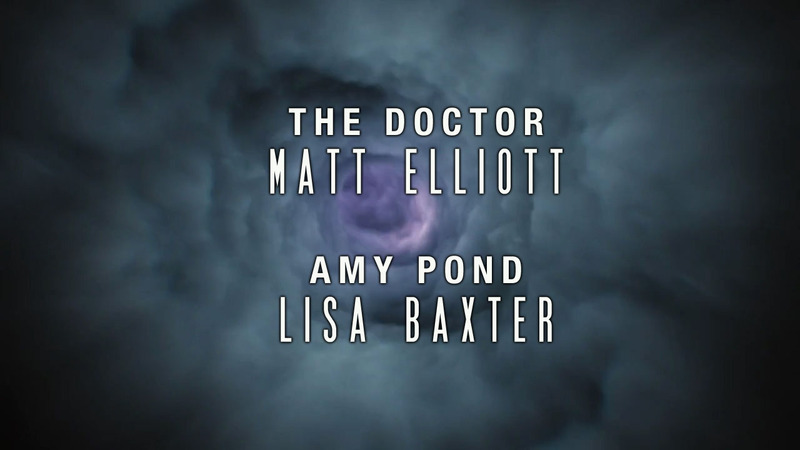 We also had a protracted discussion about how The Doctor’s Daughter (Georgina Moffat - both I screen character and real life) was now The Doctor’s Wife (as in married to David Tennant - not to be confused with Idris). Here’s a look at my diary of the summer, with the highlights of the tours I have done. This time I took a private tour for a family who’s son was a big Who fan. We had discussed many thing on our way around, and Mark Gatiss’s name came up a few times - only to then bump into him in person at Forbidden Planet at the end of the tour! My next tour was a private walking tour for a father and his two daughters. They had done the Harry Potter tour a few days prior, so were now enjoying a tour of Doctor Who locations as well. A highlight of this tour was having crossed Tower Bridge, we looked back from Butlers Wharf to see the bridge rising. Awesome sight. Against my better judgement I also had a tour the following day - but at least the next would be a bus tour instead. I was then asked to do a private tour which was a birthday present for someone who was a huge Doctor Who fan. We all met up at the designated spot and I was looking out for a boy of 8 or 12, with the intention of making it his special day. The birthday boy ended up to be a bit over 40 - and he had a very fun time seeing the classic series locations, many of which he recognised from first viewing all those years go. 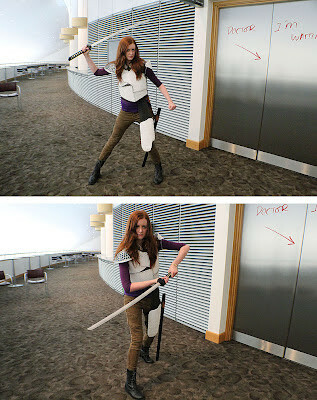 Then, after weeks of doing these tours, I had my first public tour with not one but two people in cosplay! FINALLY I didn’t feel alone being the only one in costume. 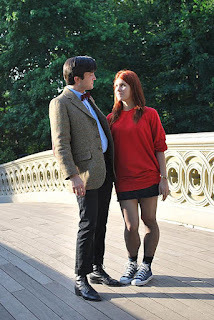 We had an English guy dressed as Matt Smith, and an American girl with a Forth Doctor scarf in a pastel colour scheme. 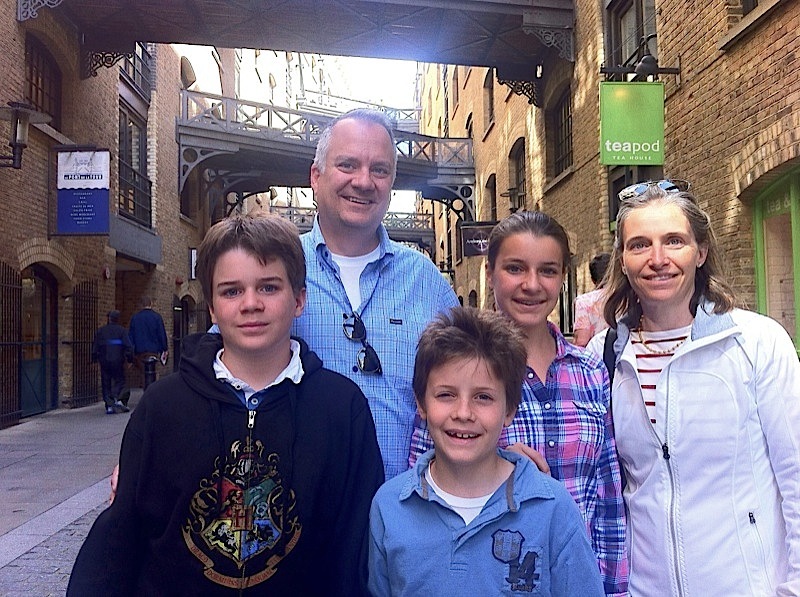 Next up was another nice family from the US, doing the European tour, stopping off in the UK for a few days, and taking in a tour of London while here. This was one of the nice tours in a mini bus. Then it was back to the public walking tours. This time the day after I attended the London Film And Comic Convention at Olympia. I had planned to go on to the second day of the convention on the Sunday following the tour, but having been on my feet all of Saturday then walking for three hours the next day - I decided to give it a miss! Can you blame me? My final tour of the main season was a private tour for a family of three from Canada. 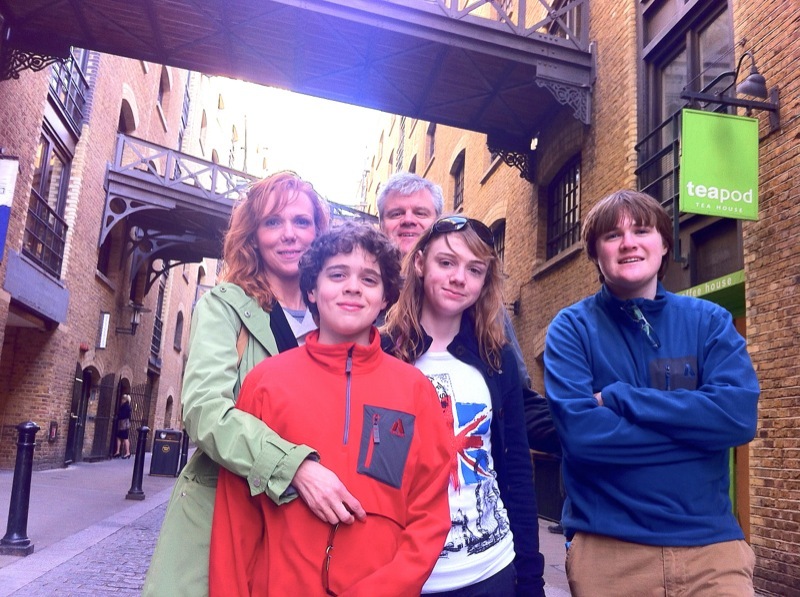 Another walking tour, it was a pleasant end to my summer of Doctor Who Tours. Due to the Olympics, we aren’t doing any tours during mid-July or August, so that’s me now until September. Last night I was at the Royal Albert Hall. 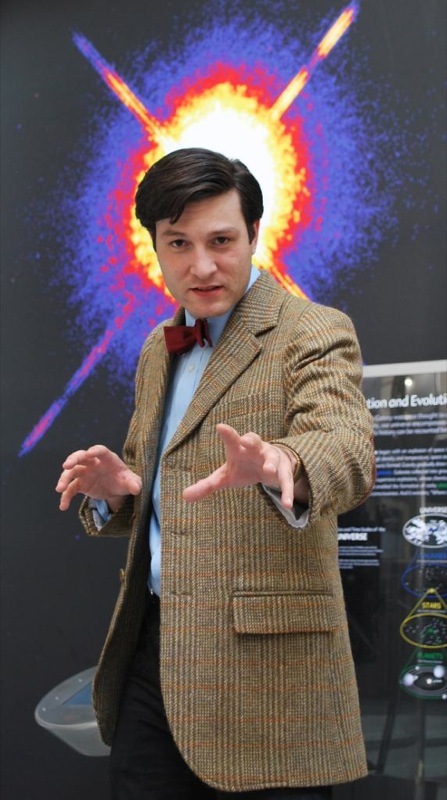 Combine that with the name Murray Gold and you might suddenly think you had missed a Doctor Who Prom concert, but no, this was something else. BAFTA, in association with The Royal Albert Hall, are doing a series of interviews under the title Conversations With Screen Composers. 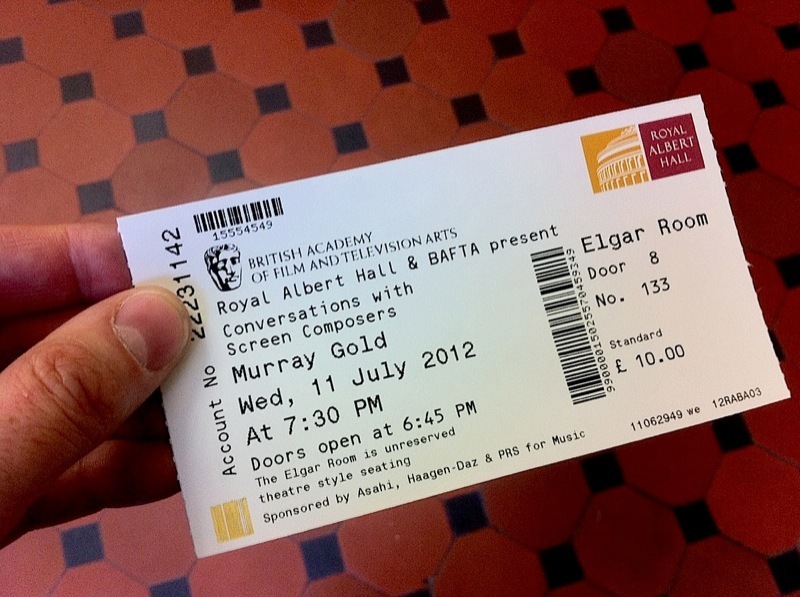 The event was filmed with multi-camera set-up, and is due to be on the BAFTA website as a webcast in the near future. I had heard about the event through one of the news websites, so rushed over to the website to book tickets, only to find they were sold out. I checked with the box office who said a number of tickets had been held over. Returning daily to the website came up trumps when sure enough the tickets were suddenly available again a couple of days before the event. I got there nice and early so I could collect my ticket, and found I was first I the queue, and nabbed front row dead centre. Perfect! The interview was conducted by Tommy Pearson, who kicked off by asking how Murray got into music. Today is the second part of The Girl Who STILL Waited, from my massive Cardiff photoshoot. While the two Amys have been searching for The Doctor, and older Amy has discovered the Eleventh Doctor behind a door . . . 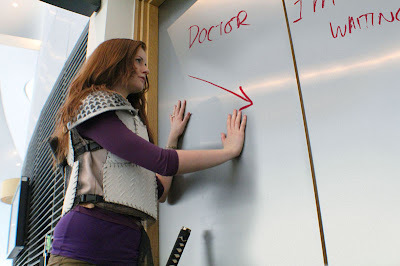 Discovered by Amy, The Doctor has some explaining to do, after all she has been waiting a long time. No matter what he says, the feisty Amy counters his every move. She’s having none of it. 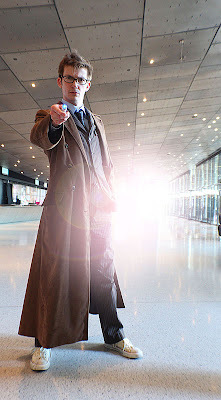 While the Eleventh Doctor is fending off an angry Amy Pond, the familiar buzz of a hand-held sonic device echoes through the empty lobby. 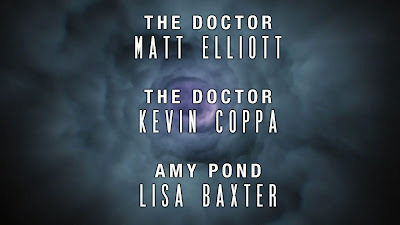 It is the Tenth Doctor, who has traced his other self and the parallel Amys through a time displacement in the vortex. He knows he must close the displacement to prevent a potentially universal catastrophe. Tracing the signal he finds his way to the upper levels, where he surprises both his other self and the aggrieved Amy Pond. 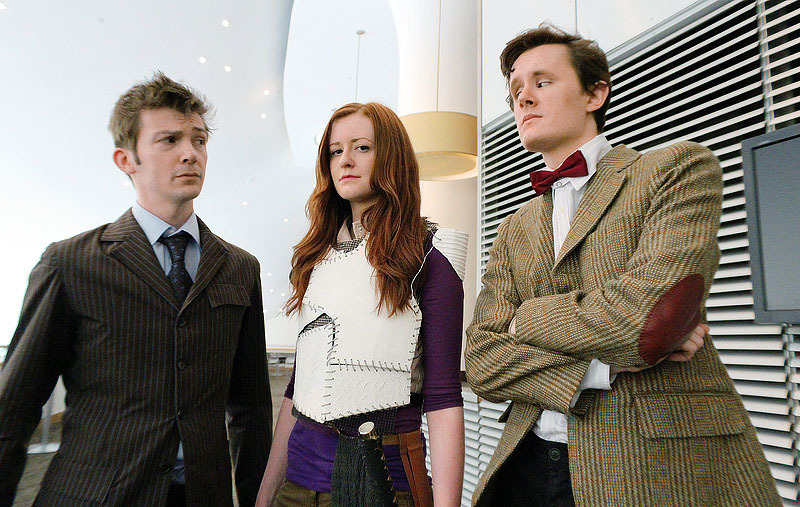 Strangely the Tenth Doctor has a calming effect on Amy, and he soon has her under control, to the irritation of the Eleventh Doctor. 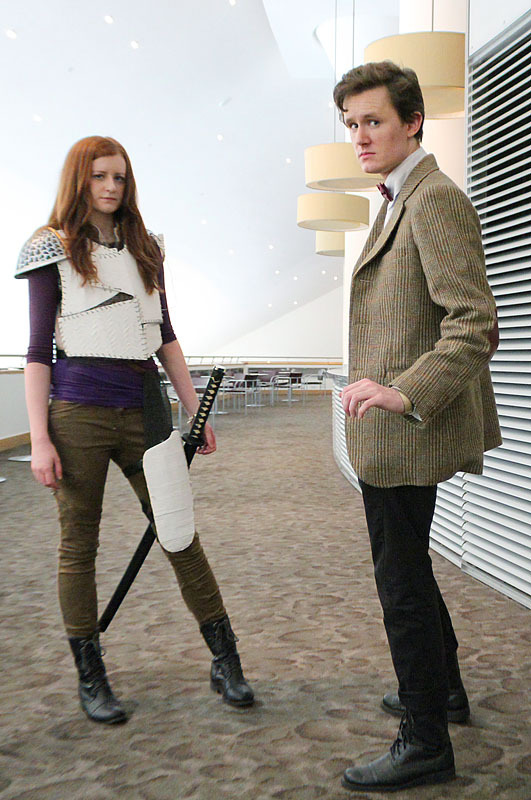 Back in the lobby the Tenth Doctor and Amy are getting on like a house on fire. 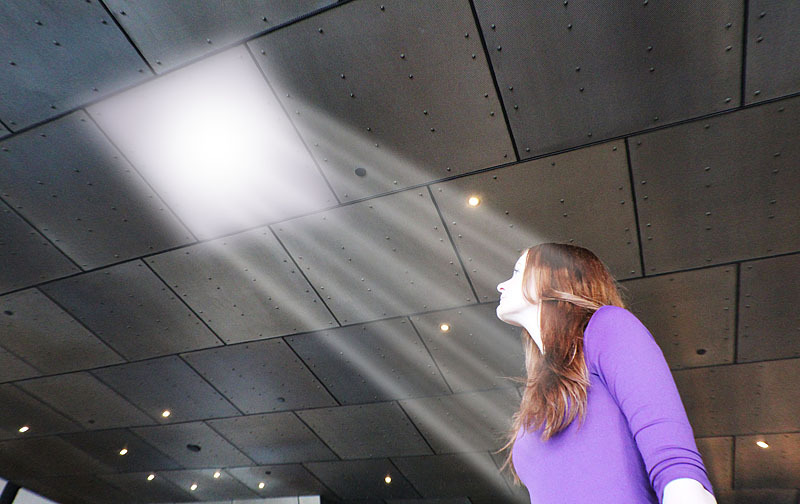 She is entranced by his tales of adventures on distant planets, meeting exotic aliens and saving the universe. 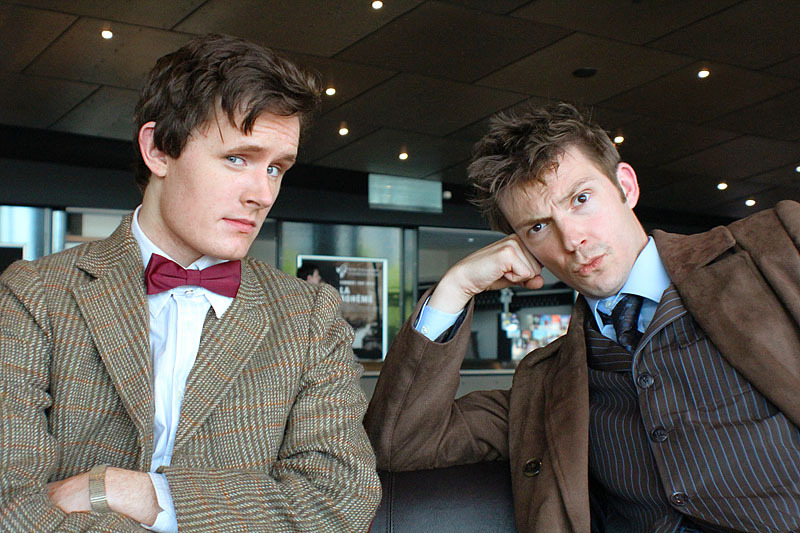 All the Eleventh Doctor can do is sit and listen, feeling increasingly left out. 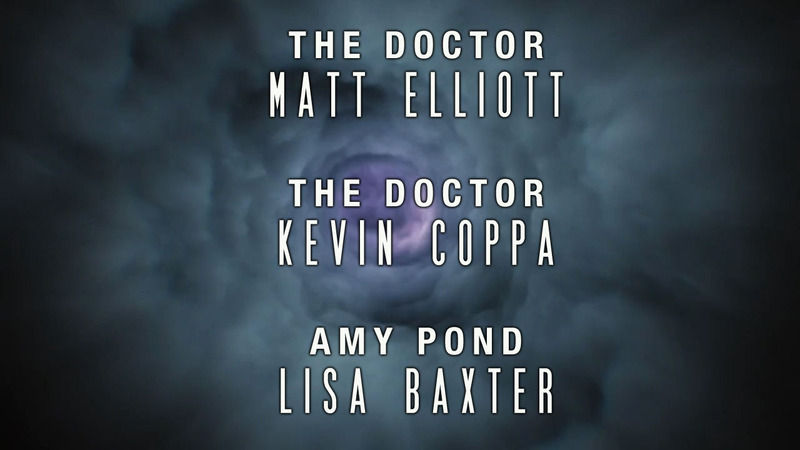 But it’s Amy’s choice - who will she choose to travel with? The charismatic Tenth or the ever-faithful Eleventh Doctor? 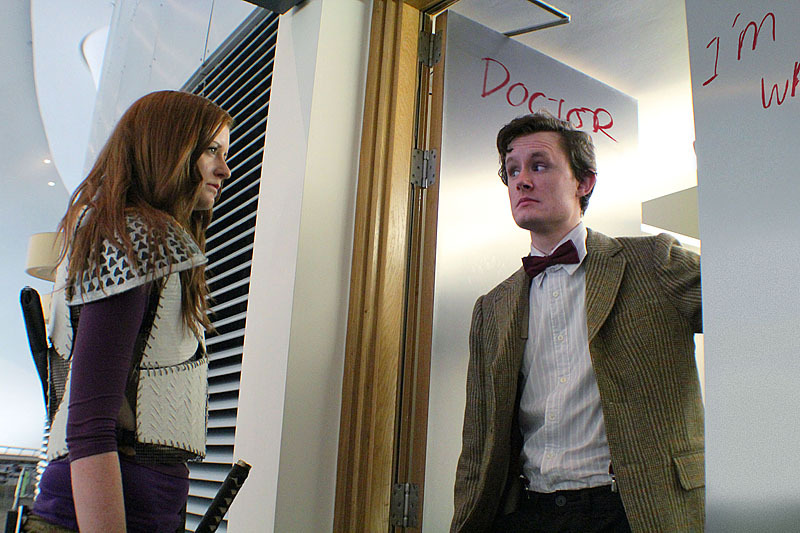 There isn’t really a choice to make - the Eleventh Doctor is AMY’s Doctor! 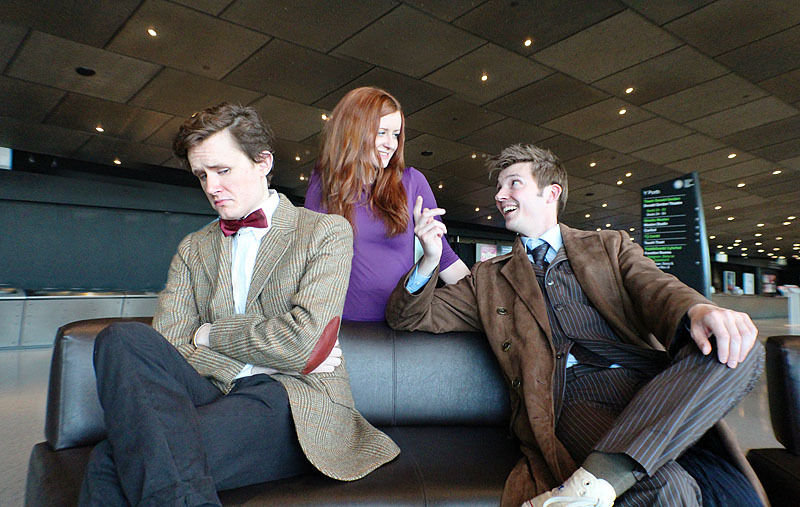 I’d like to thank Matt Elliott, Kevin Coppa and Lisa Baxter for modelling for the photoshoot and an extra special thanks to the management of the Cardiff Millennium Centre who granted us special access to the upper galleries. Today I’ve got some more pictures from my Cardiff photoshoot. 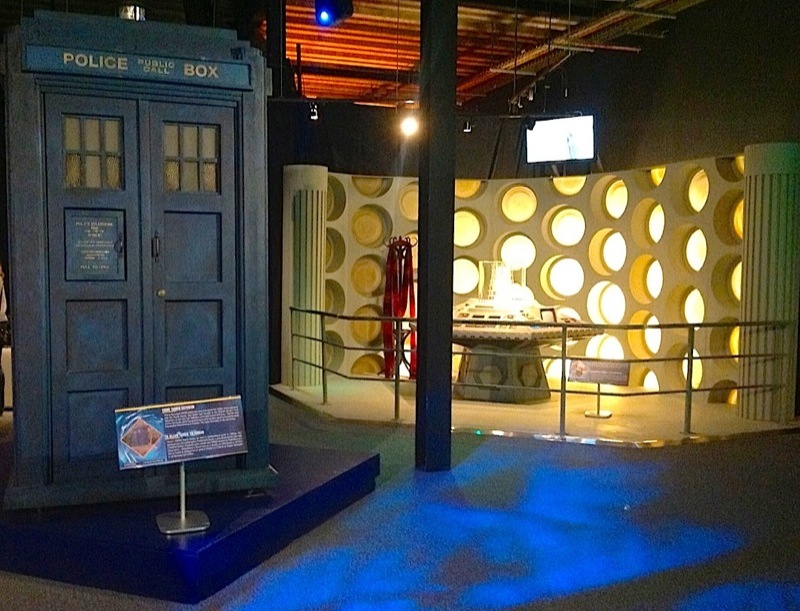 As well as visiting Eddie’s Diner, we also gained very special access to the Cardiff Millennium Centre. 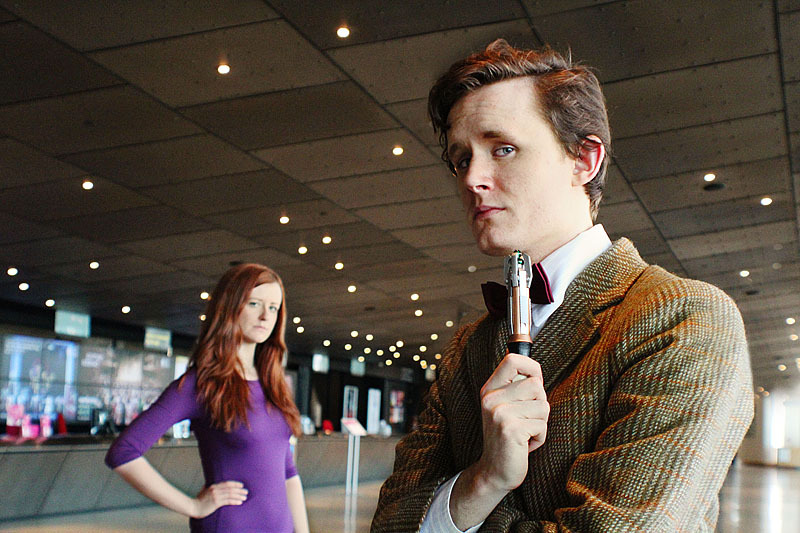 Not only was it the venue for the recent Official Doctor Who Convention, it was also the location used in the David Tennant story New Earth and the Matt Smith adventure The Girl Who Waited. 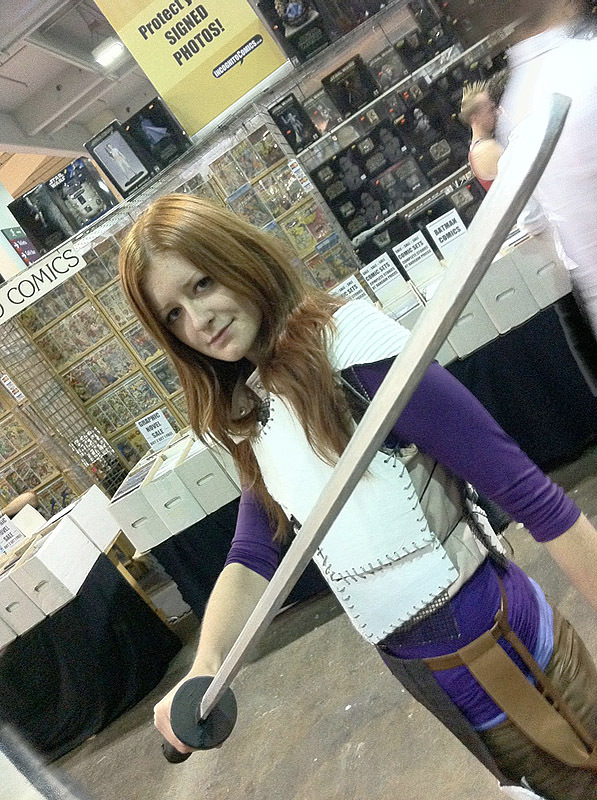 I had originally met our Amy Pond for the day, Lisa Baxter, at last years Entertainment Media Show, where she debuted her armour barely two weeks after The Girl Who Waited was broadcast. So when I was planning our Cardiff shoot, I knew SHE was the one Amy I wanted along! 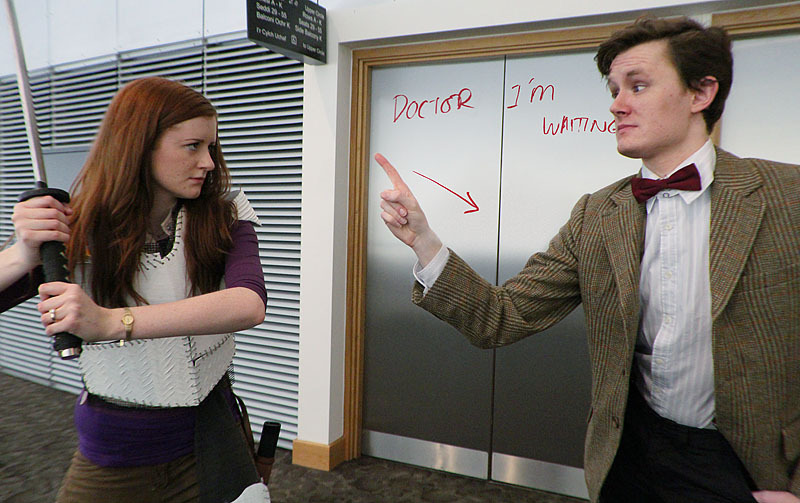 I made a particular point of approaching the Cardiff Millennium Centre so we could visit the upper galleries and see the doors where Amy wrote her lipstick message to The Doctor. 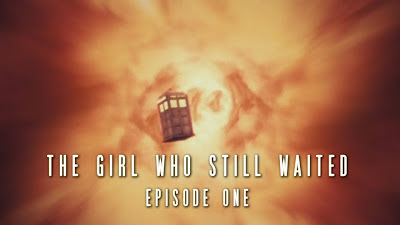 Here is the first part of our mini episode - The Girl Who STILL Waited. 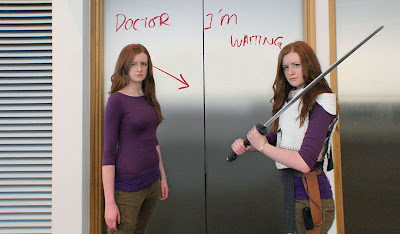 Amy has found herself trapped in a parallel timeline, isolated from The Doctor and Rory. Later Amy, now many years older, meets her younger self. 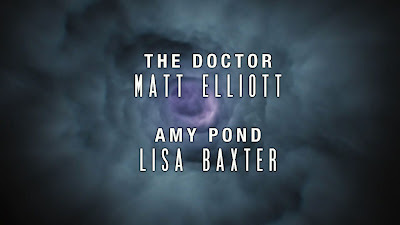 The two Amys devise a plan to find The Doctor, and they set out to search the facility until they find him. 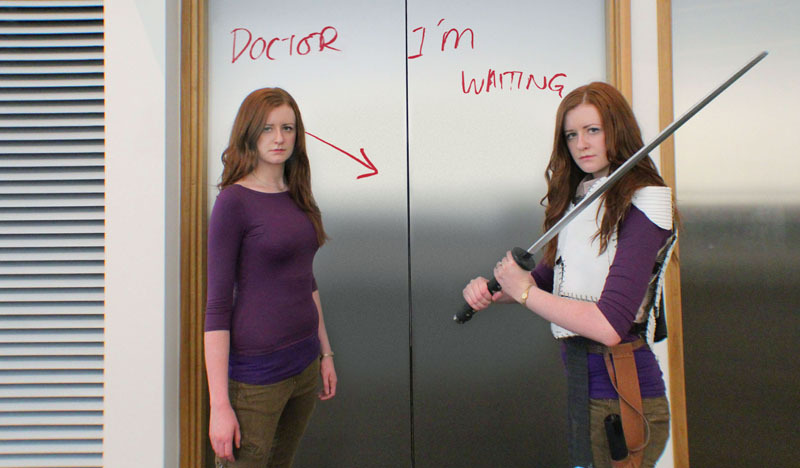 Amy finds herself drawn to a door where she had earlier left a message for The Doctor. Touching the door she feels a connection to her Time Lord custodian. 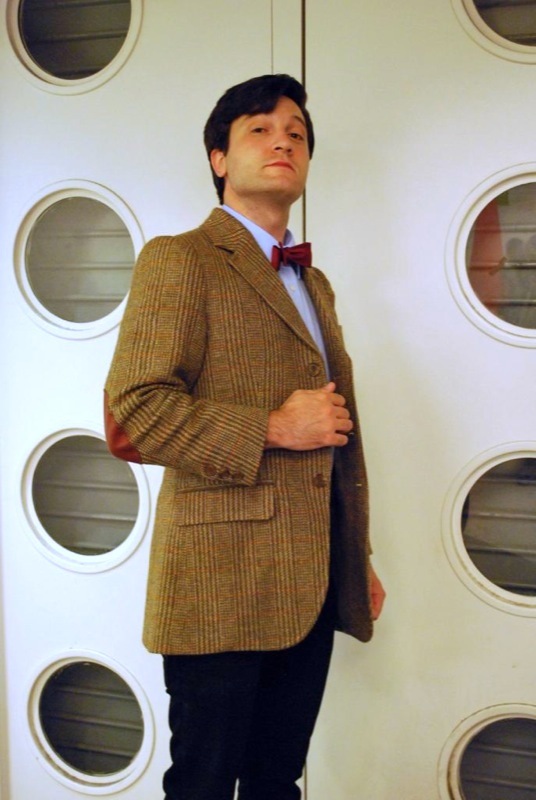 Suddenly the door flies open to reveal THE DOCTOR . 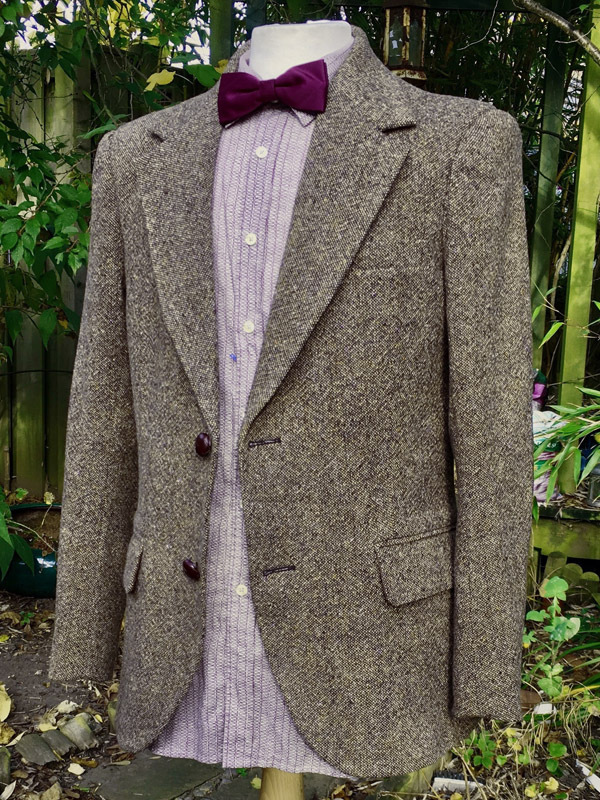 . .
Last month I had to get a Shetland Tweed jacket done for a client in time for a photoshoot in New York’s Central Park. The photos are in, and the client was happy! Here’s what he had to say about the jacket I made him. 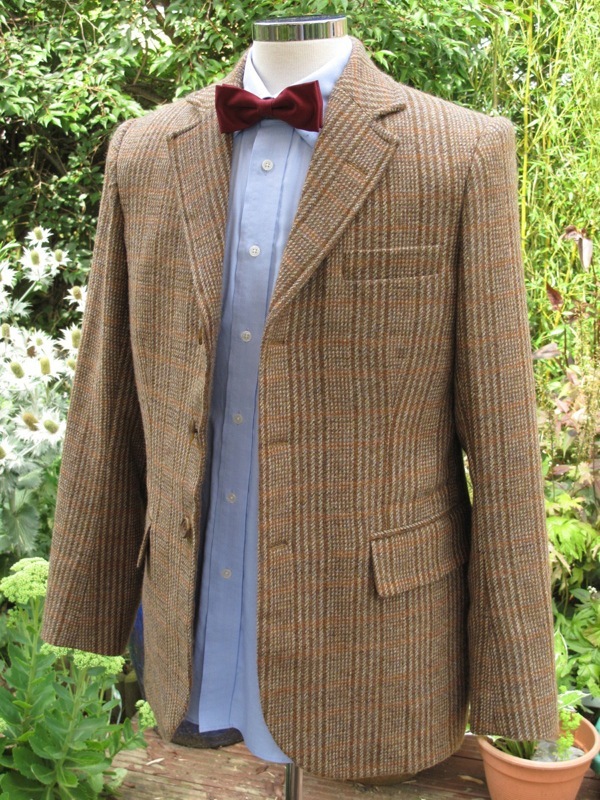 Any reservations I had about the price tag on Steve Ricks’ replica 11th Doctor tweed were immediately thrown out the window the moment I pulled it out of the shipping box. This jacket, even though made out of the same fabric as my previous Doctors’ tweed from another leading costume maker, just FEELS more solid. The gorgeous white liner in the sleeves just makes this jacket look and feel more luxurious. Not leaving anything to chance or error, I sent Steve one of my own jackets that fit me perfectly to use as reference when creating this new replica. 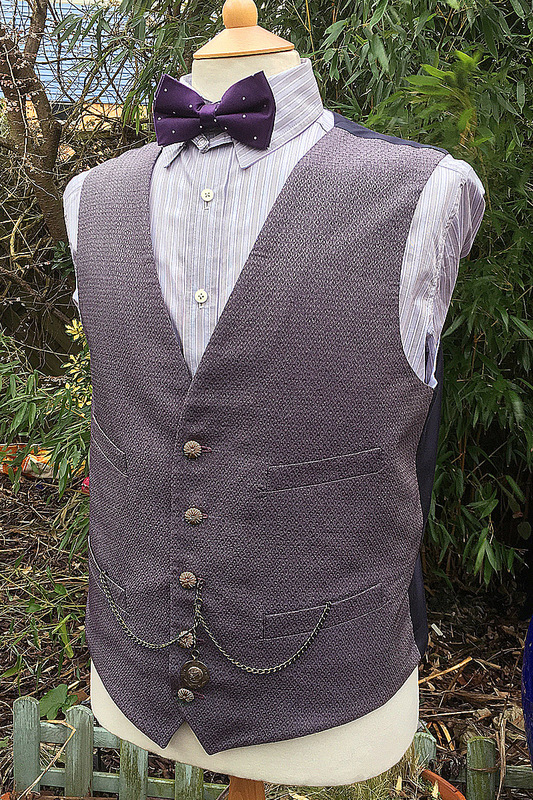 That was one of the single best things I could have done as Steve absolutely nailed the fit and even accommodated my request to ensure the sleeves were cut slightly shorter just like Smith’s jacket. The details? Well, there is no arguing the authenticity of the details because Steve has done the homework on this and I have to admit, I felt a lot of confidence wearing this knowing it was created with a wealth of knowledge and appreciation backing it. My jacket arrived to me just in time for its maiden adventure to New York City for a day at the American Museum of Natural History and Central Park.